Willow Springs Station, which neighbours Upalinna, was one of the early pastoral leases in the Flinders Ranges and was purchased by the Reynolds family in 1952. Willow Springs which was formerly known as Appealinna was taken up by Joseph Wills in 1856. Willow Springs remains a pastoral lease of 70,000 acres or 28,300 hectares. Willow Springs Station is a typical sheep station of approx. 70,000 acres or 283sq km that offers visitors true bush hospitality and quiet secluded settings. The picturesque setting neighbours the Flinders Ranges National Park and is central to all popular features and destinations in the region. Skytrek Willow Springs Station is a working sheep station in the Flinders Ranges offering true bush hospitality in quiet secluded settings. Owned and operated by the Reynolds family for 4 generations, Willow Springs is a sanctuary for those who want to connect, relax and really experience the local life and the atmosphere and ever-changing contrast of outback colours. Our exhilarating full day 4WD track, Skytrek is described as ‘truly memorable’ by visitors and placed on numerous Bucket Lists by 4WD, Camping and Adventure magazines. 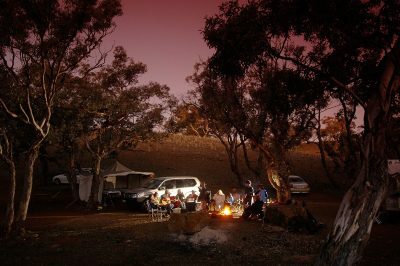 Willow Springs offers a truly sharable experience in the Flinders Ranges. Located 21km north east of Wilpena Pound on the Wilpena to Blinman Road and adjacent to the Flinders Ranges National Park. A choice of 5 private comfortable self-contained buildings for small or large groups ranging from 1 to 33 beds, Private and secluded bush campsites, Amenities including a camp kitchen, Marked walking and mountain bike trails, Guided 4WD tours and Self-drive 4WD track – Skytrek Tours. We offer a choice of 5 private and self-contained buildings – Jackaroo’s Cottage, The Homestead, Moxan’s Hut, Overseer’s Cottage or the Shearer’s Quarters. Experience true bush hospitality in quiet secluded settings for up to 34 people. All you need to bring is your own food, linen and extra blankets in the colder months. Each building includes all cooking facilities, utensils and cutlery, 2 blankets and pillows per bed, except Moxan’s Hut which does not have blankets and pillows. Our camping sites offer you privacy, a sense of isolation and security. The bush camping sites come complete with a fire ring and BBQ plate. Ablution amenities are available near the homestead, but each site has a long drop toilet.